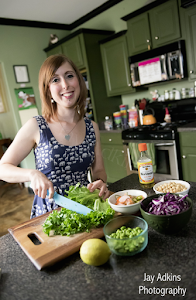 Here's a round-up of what I've been eating this week! We'll start with this Double Chocolate Brownie Protein Waffle by FitQuick with maple and raspberries. 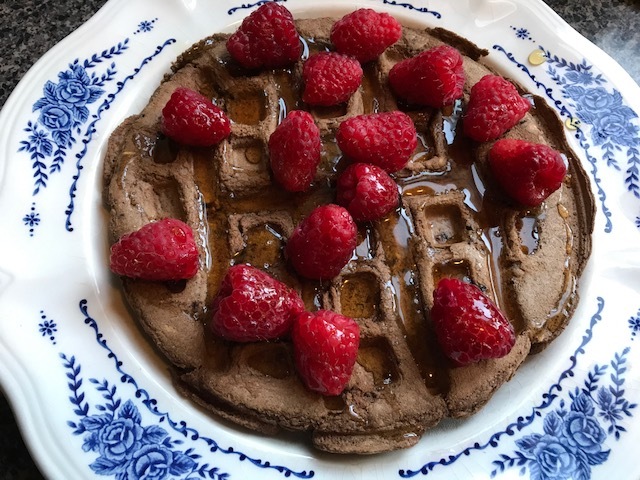 I've been eating FitQuick waffles after at least one weekly run for a couple years now, and I'm still not tired of them! 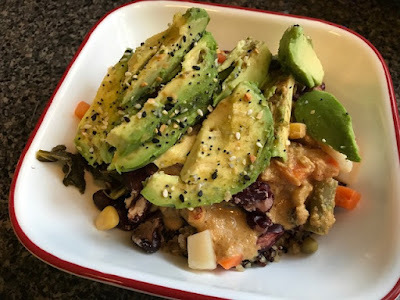 Here's a thrown-together Taco Bowl of quinoa, kale, kidney beans, and some Veg-All (from a can!) topped with avocado and a quick nooch sauce seasoned with taco spice. And here's a Loaded Avocado topped with brown rice, kidney beans, zucchini, corn, bell pepper, cherry tomato, and salsa. Last Saturday, I went to an afternoon tea party for my friend Nathan's birthday. He made these yummy Baked Sweet Potato Chips topped with hummus (on the second and third tiers). And he made Cherry Tomato Bruschetta with Everything Bread. I'm all about everything anything! He also made a really fun vegan dessert by crumbling chocolate Oreos and mixing with extra filling from some golden Oreos to create a sort of chocolate buttercream, which he then piped atop the golden Oreos and topped with strawberries. Here's a post-run Warm Oats & Protein Nice Cream bowl with blueberry protein banana soft serve. The oats were sweetened with maple syrup. 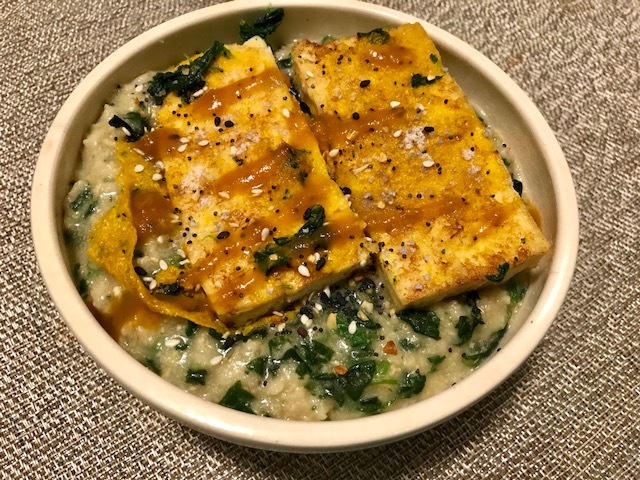 And here is a bowl of Savory Spinach Oats with Tofu Egg. 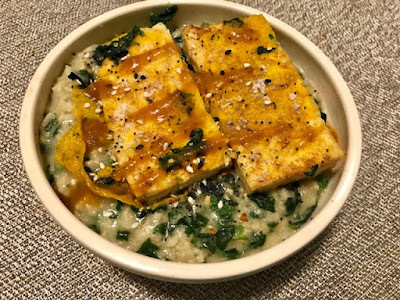 I mixed some frozen spinach, vegan butter, nooch, garlic powder, and Bragg's into my oats, and then I topped with pan-fried tofu that I spread with Vegg yolk as it cooked. Topped with habanero sauce, natch. 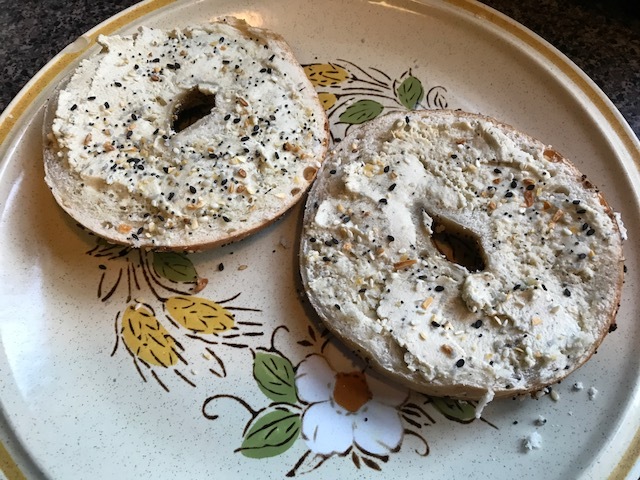 Still eating lots of Dave's Bagels. Here's an Everything Bagel with Leaf Cuisine Garlic Herb Probiotic Cashew Cheese. Found the cheese at Whole Foods in Little Rock. It's so good! And finally, here's today's lunch! Our chef at Crosstown Arts and his team made hummus, baba ganoush, and tabbouleh for the resident artists, and they stashed the leftovers in the office fridge. 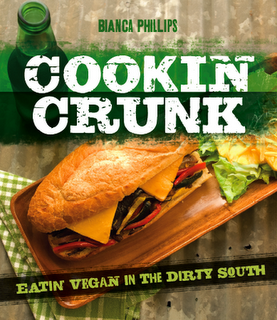 I brought quinoa, chickpeas, and collards from home and topped with the hummus, baba, and tabbouleh. 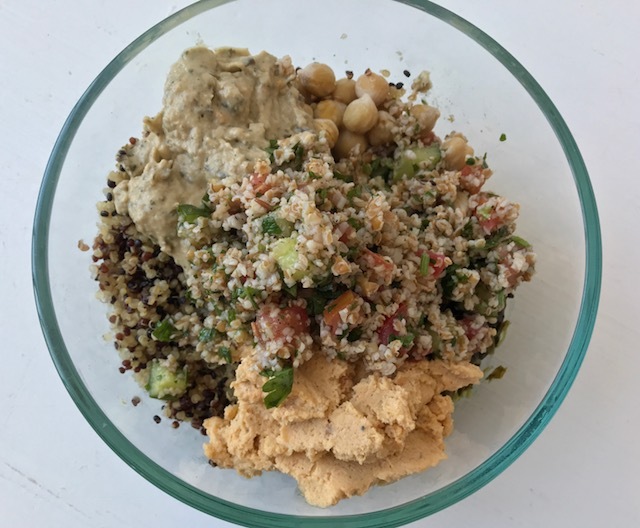 Perfect Mediterranean Bowl! Hope y'all have a happy St. Patrick's Day weekend! It's one of my favorite holidays. I'll report back on Sunday with an Irish food and drinking recap. Oooh everything looks amazing! 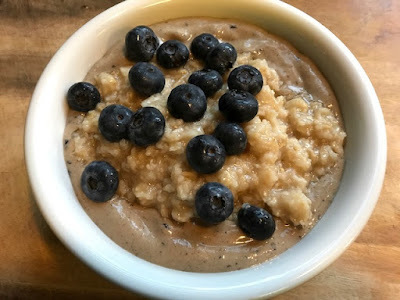 I have to try the warm oats with nice cream combo, that seriously sounds so amazing! 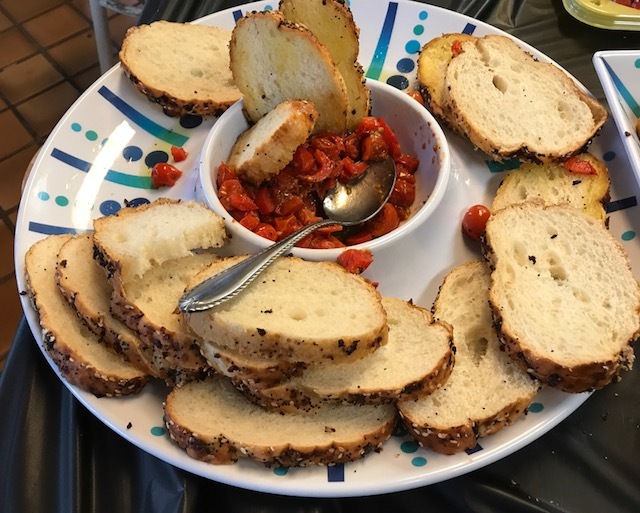 I've been seeing bruschetta pop up everywhere and now I'm seriously craving some. I can't wait for tomato season so I can eat it during the best time. The Mediterranean bowl is right up my alley too! Loaded avocado, why haven't I thought of that? That looks really amazing! I agree with Sarah again, can't wait to hear about your St. Patrick's Day! !